Think of a desert. What races through your mind? Unending stretch of sand, landscape interspersed with scanty vegetation and insufficient water. Now tell me what kind of world can your imagination create with such limited resources? 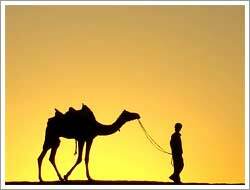 When you travel to the Incredible Rajasthan, compare your imagination with the reality of this desert. All you will be left to believe is “Truth is stranger than fiction”. And the truth is that the enchanting Rajasthan vibrates with passion and liveliness and it clearly manifests in its culture, heritage, fairs and festivals, cuisine, music and dance, fabulous monuments, royal havelis and stunning palaces which the invincible people of Rajasthan created out of very limited resources to overcome the barrenness of the Great Indian Desert Thar. World is a book and the wonderful land of Rajasthan is one of the most important pages written in golden words which must be read by a real traveller. Rajasthan is the most famous destination of India. It is a land with rich heritage and countless legends. Tourists from far and wide flock to this majestic land to explore its royal heritage, beauty, history and vibrant culture. Rajasthan is dotted with numerous mesmerising destinations each flaunting its own beauty and itching to tell its own unique story of bravery and beauty. The most explored destinations of Rajasthan are Jaipur the capital city, Udaipur, Jaisalmer, Jodhpur, Ajmer and Mount Abu. Each destination is special for a different reason. The rich culture of Rajasthan is intricately woven into the lives of its people. It reflects the true Indian culture. Several fascinating dance and music forms are a part of each and every celebration in the state. The craftsmen of Rajasthan are celebrated the world over for their extremely beautiful and fine quality handicrafts such as wooden furniture, carpets, tie and dye textiles, embroidered fabrics, fabrics with mirror work, marble statues, paintings and blue pottery. Any talk about Rajasthan is incomplete without the mention of its luxurious Palaces and Havelis. Once the royal abode of the Maharajas, Rajasthan abounds in stunning palaces, some of which have now been converted into Heritage Hotels for providing a royal stay to the travellers coming to Rajasthan. This state is blessed with delicately carved temples such as the world famous Dilwara Jain Temples, amazing monuments like Jantar Mantar, massive forts like Meharangarh fort, and Keoladeo Ghana National Park (bird's paradise). The traditional Rajasthani womenfolk wear bright coloured dresses complimented by funky silver jewellery and the men are equally inclined towards jewellery. They also wear bright colours. Cuisine was always a serious business in Rajasthan as a result of which the kitchens of the state offer a wide variety of vegetarian and non-vegetarian food. The people here are very hospitable. Scan the bazaars (market) of Rajasthan for high-quality handicrafts and semi-precious stones which are known for their quality and are also quite reasonable. The rich land of Rajasthan has a lot to offer. Come and explore yourself!